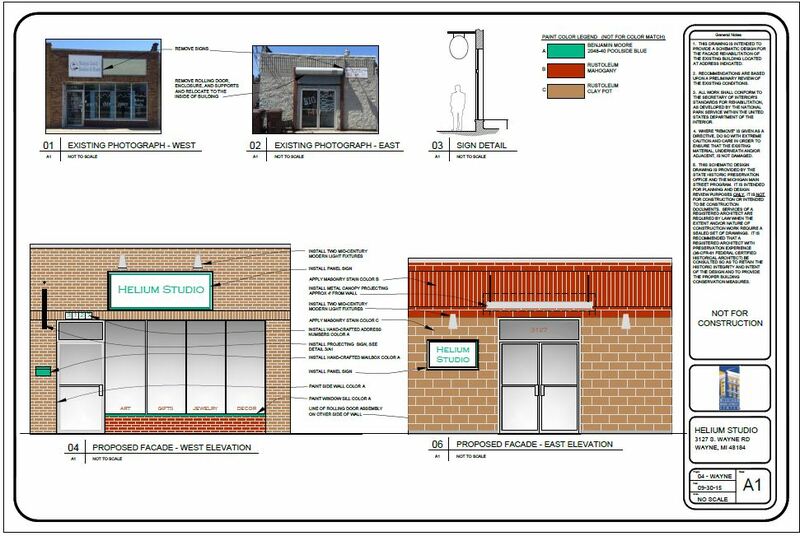 Wayne, MI — The Wayne Main Street Program has recently received design services for proposed façade improvements for three buildings in downtown Wayne. Two of the buildings, located at 35122 and 35118 W. Michigan Avenue, are home to Greater Dreams Church and are viewed as key buildings in Wayne’s efforts towards revitalizing the downtown. The other building, located at 3127 S. Wayne Road is home to the recently opened artist market, Helium Studio, where some of the elements of the design have already been implemented. 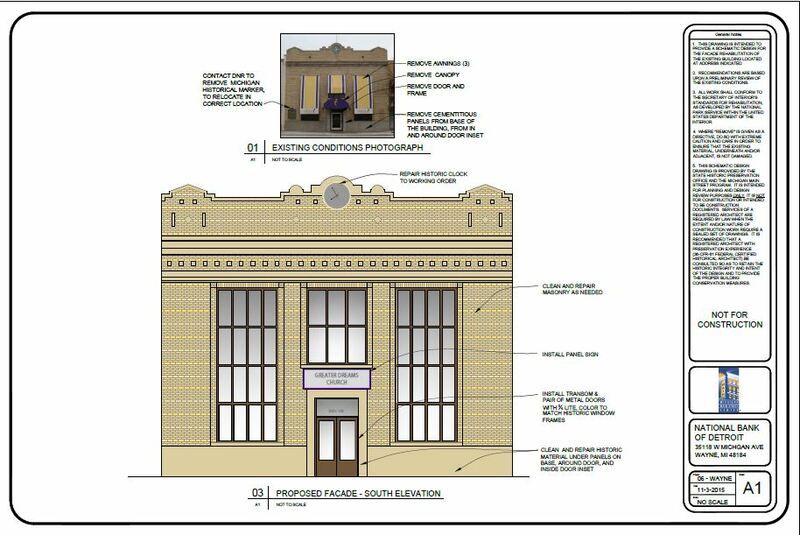 The State Historic Preservation Office’s Design Specialist, Debra Ball Johnson, AIA, created renderings for façade improvements after meeting with the property owners to discuss ways to address the needs of their business while considering the historic character of the buildings. “The intent of the proposed design is to outline a long-term ‘vision’ for the building that will return the façade of the building back to its original appearance, improve the visibility and appearance of the business, and retain and enhance Wayne’s identity as a historic community,” states Johnson. The Wayne Main Street Program received the design services from the Michigan Main Street Center, in partnership with the State Historic Preservation Office (SHPO) at the Michigan State Housing Development Authority (MSHDA) as part of Wayne’s participation in the Michigan Main Street program. The design services are provided at no-cost to the property owner and are just one of the benefits communities receive by being part of the Selected Level of the Michigan Main Street program. Wayne Main Street Director, Lindsey Wooten, stated the following: “We are extremely thrilled with the services that Greater Dreams Church and Helium Studio have received. 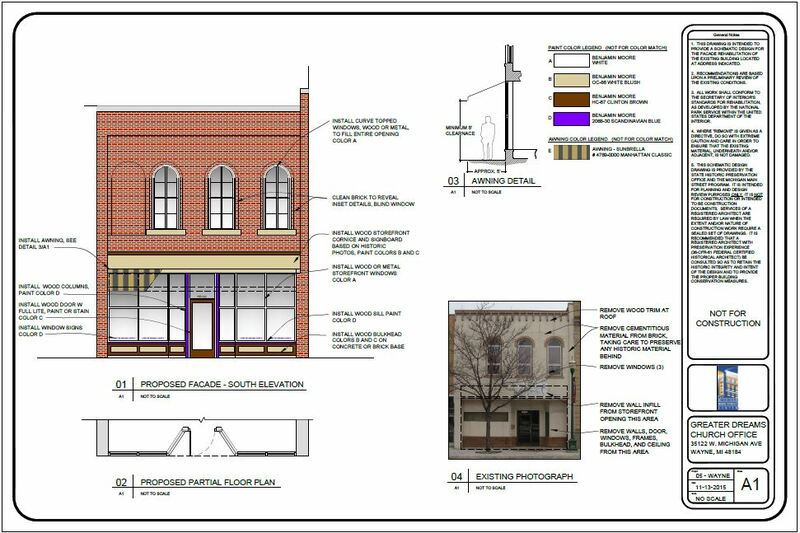 We are equally excited to work with the property owners to implement the suggested improvements and will encourage them to apply for our Façade Grant Incentive program to assist with project expenses.” For more information about the design services and the Wayne Main Street Program, please visit http://www.downtownwayne.org. Wayne Main Street, a Michigan Main Street program, is a nonprofit 501(C)(3) organization. We are a positive force working with our community, business and property owners to preserve, enhance, and promote our historic downtown as a vibrant destination for residents and visitors to gather, shop, work, and enjoy.